Are you getting ready for the big day? Achieve a picture perfect smile for your wedding day with cosmetic dentistry procedures for brides and bridesmaids on Long Island, NY. Come in for your no-obligation cosmetic dentistry consultation before your wedding to see if we can give you your perfect wedding smile. We have several convenient locations throughout the Long Island, NY areas in Suffolk and Nassau Counties. To schedule your cosmetic dentistry for brides consultation with Dr. Jacquie Smiles on Long Island, NY, please call 845-827-1149 or fill out the contact form to receive additional information on how you can achieve your wedding ready smile. 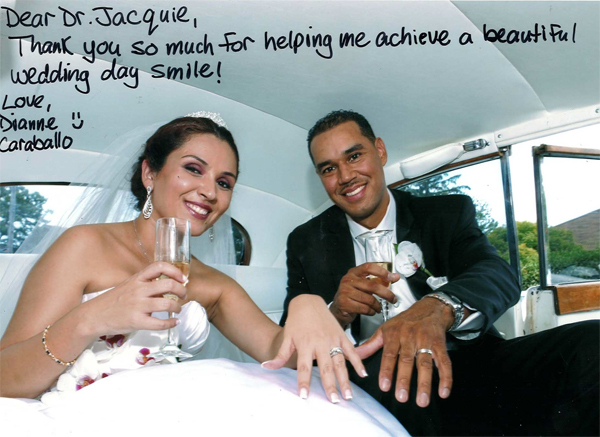 Dr. Jacqueline Fulop-Goodling helps brides on Long Island create the smile of their dreams every time they smile and each time they open their wedding album. Don’t be dissappointed with your smile. Dr. Fulop-Goodling can help straighten and whiten your teeth for your special day. Feel more confident when you smile by scheduling a professional teeth cleaning treatment before your wedding. Our teeth cleaning sessions include gentle polishing of the teeth for a brighter and more attractive smile. Don’t wait! To schedule your cosmetic dentistry for brides consultation on Long Island, NY, please call 845-827-1149 or fill out the contact form to receive additional information on how you can achieve your wedding ready smile.